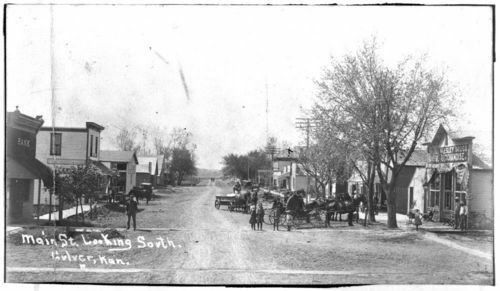 This photograph shows Main Street looking south in Culver, Kansas. The business on the far right of the picture has an obscured store name, with part of the sign advertising drugs and general merchandise. A bank is visible on the left side of the picture, and several adults and children, along with several horses, carriages, and wagons are visible in the photograph. Holding Institution: Harry Hughes, 1970.